Kate presents the RT International News on 29th July 2018. More reporting from Kate in Moscow’s Fanzone during the World Cup 2018 Last 16 match on July 3rd, when England beat Colombia 4-3 on penalties (1-1 AET). Kate reports from Moscow’s Fanzone during the World Cup 2018 Last 16 tie between Colombia and England on July 3rd. 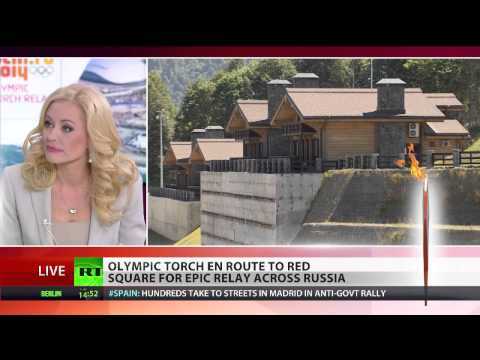 Kate joins Kevin Owen and Andrew Farmer on RT News to talk about the Sochi Games as the Olympic flame arrives in Moscow ahead of its record-long relay.